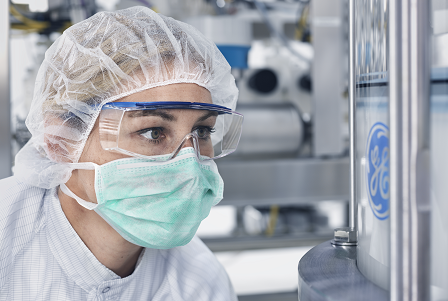 Chromatography resins used for production of biopharmaceuticals need to be cleaned efficiently to ensure safety and efficacy of the bioproduct. Impurities that are not removed can build up on the chromatography column and start to leach into the process material in subsequent cycles. An efficient cleaning of the column in each cycle will prevent fouling and minimize risk of carry over between cycles and batches. Column fouling can also result in a capacity decrease over time with a subsequent decrease in the resin lifetime. The increased resin utilization by column reuse for an appropriate number of cycles will positively impact on process economy. This is especially true for proteinbased affinity resins, like protein A resins, which have a higher price tag due to more costly development and production of the ligand compared with resins based on low-molecular weight ligands such as ion exchange chromatography (IEC) or hydrophobic interaction chromatography (HIC) resins. Harsh cleaning conditions will result in a more efficient cleaning, but can at the same time destroy a susceptible resin. Therefore, it is essential to balance the harshness of the cleaning procedure with the compatibility (stability) of the resin. Although process economy is of utmost importance, patient safety will always be the overarching objective. Here, we exclusively discuss CIP of protein-based affinity resins for purification of monoclonal antibodies and antibody fragments, whereas sanitization and bioburden control is addressed elsewhere (1). Both CIP and sanitization are thoroughly reviewed in “Biopharmaceutical processing: development, design, and implementation of manufacturing processes”.